New Mark Feehily fan "childhood wish" accomplishment alongside his debut album, "FIRE"! If you grew up with me, you may have known how much I was a Westlife fan back then. Typical teenybopper during my teenage years, which somehow I have outgrown, this trait is dormant, yet still lingering and waiting for that perfect moment when it would come out again. I used to have a wishlist/bucketlist when I was 11 years old. One of them was to meet Mark Feehily. I used to live in the Philippines, and I only got to see him through concerts. I wanted something more personal at least. See him up close or at least get noticed for once. In 2011, my first wish was granted. He tweeted my Westlife fan video! My embarrassing parody video finally got noticed. 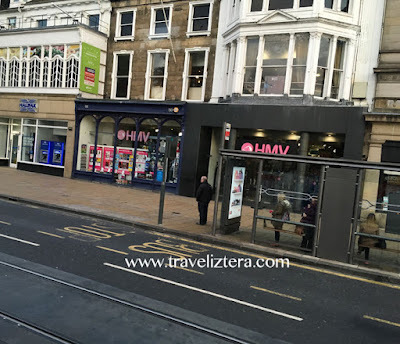 So recently, I went on a trip to the UK with my parents. My favourite Westlifer is MARK FEEHILY. I was aware that he has a new album, and you know, I felt there was something up. And there it was. He had album signings all over the UK! I looked at my itinerary, and nothing really coincided with his album signing dates. I lost hope. When I was in Edinburgh, I felt like checking his page despite hopelessness. And then I looked at the date. I was looking at my itinerary wrongly. HE WAS GONNA BE IN EDINBURGH THE SAME DAY AS ME! ANDDDD, the venue was the street across our hotel. Maybe around 10 minutes away. I took this photo while we were on the tour bus. Sadly, we had to go somewhere at exactly the same time he was starting his signing. I got sad. But it's okay, because I got another good surprise when I went back home. 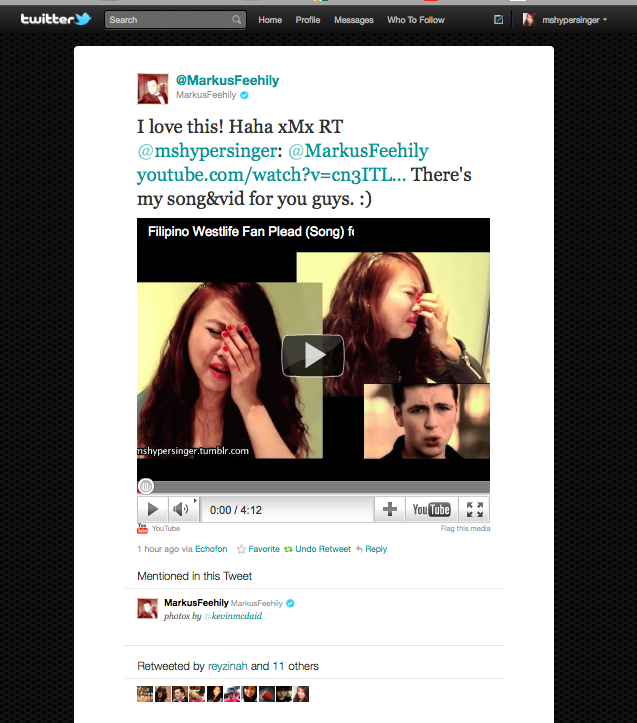 My video (screenshot above post) was included in Mark's "Only You" Official Fan Music Video! This is such a wonderful and touching song. Thanks Mark for choosing my video. I am really touched. I'm around the 0:32 mark. So alongside this, I also got my wish to at least take a photo with Mark Feehily at Westminster, London. It's still Mark so it counts. Thanks Rap for the photo. For now, I guess I'm happy that I got to at least have some opportunities to have a connection with Mark this year, in addition to him tweeting my Westlife fan video in 2011! Thanks Mark for the wonderful opportunities. You are checking off my childhood wishlist/bucketlist through simple ways like including my video in your "Only You" music video! Good luck on your new album!!! Love it!